Imagine waking up without thinking about your body, and instead looking at yourself in the mirror with nothing but self-love. You put on your favorite outfit and walk outside feeling like the badass you are. Being someone in search of that feeling for a while, I’ve turned to Instagram to find women living that exact life. 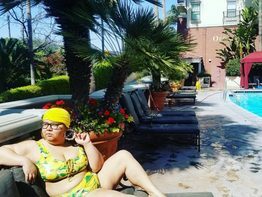 Virgie Tovar, a fat activist based in San Francisco, is one of the first women I’ve found, and I’m now obsessed with her feed, especially her messages of body positivity, unapologetic living and phenomenal fashion sense (I need to get one of these bejeweled bustiers). Upon further investigation, I learned that she is not only a leading expert on body image, but also the author of “Hot & Heavy: Fierce Fat Girls on Life, Love & Fashion,” and writes thought-provoking pieces about fat activism (check out this piece on why it isn’t always a good thing to call someone ‘your inspiration,’ even if its well-meaning). I called her up to hear more about her story and how women—including myself—can feel better about our bodies right now (read until the end!). KM: How did you get into fat activism? VT: I got into this work because I was born a fat person into this culture. When I was in grad school, I wanted to study fat women and how their body size affected their gender over a lifetime. Gender? How do body size and gender intersect? When I interviewed other fat women, I found that a lot of us have specific gender stories, which is rare for cisgender people. Most cisgender individuals don’t really think about gender. All of this goes back to my childhood. I grew up watching movies that showed women being treated with desire, like they were delicate flowers. I was never treated like that; I was treated like a boy. My friends who were girls would always position me into the male roles when we would play house. I was expected to be the boy character because of my largeness. It was never discussed, but always understood. Did you talk to your grad school advisor about your interest in this work? I did, and got a lot of resistance. I remember going to her and saying that I wanted to study fat women. She responded by telling me it was “career suicide,” that everything about the issue had already been written and that there was no more work to be done on the matter. Holy crap! What did you do? I really respected her and took her words to heart, but fortunately, I was dating someone who was fat positive. He was sitting outside the room and overhead her comments. The minute I walked out, he told me I should do whatever I wanted and that I shouldn’t let her fat phobia deter me. Everything became seamless once I changed advisors, and I got a book contract right as I was finishing grad school. Did your grad school research lead you to activism? Yep. My research led me down the rabbit hole of fat activism. I started meeting people doing this kind of work, and it changed my life. For the first time ever, I was seeing women wearing amazing outfits, eating what they wanted. I was born a fat person into a fat-hating culture. I’d made myself sick trying to lose weight. Even when I was trying my hardest, I wasn’t anywhere near a weight where people would say I was normal. This work felt like the only way I could survive. I wasn’t going to live a life of shame anymore. My book was born out of the realization that there was a global network of people doing this work. I wanted to show readers their stories. Lets talk about this movement. Why do you think body positivity is coming to the forefront right now? Social media has done a lot to expose communities of individuals who were told not to say anything—like my advisor had told me. The Internet and the democratization of information has brought together amazing people and put them in the spotlight, so we don’t have to be afraid to speak our minds anymore. We don’t have to be afraid to be the first person in our town to feel a certain way and speak out. With the Internet, we may find that we are the 20th person in our community, maybe the 1,000th person, and we don’t feel so alone. Do you ever feel demoralized by the haters out there? I do. There is a substantial portion of our economy dependent on women being unhappy with their bodies, but there are a few things that ground me. First, I’m very aware that this is a cultural problem. It brings me hope to see that we are getting to a tipping point where the majority of people are beginning to recognize that fat phobia and hating is a form of bigotry, and that we simply don’t have room for it in our culture. It grounds me to think of this as an injustice, something bigger than all of us, that we are all paying for. And second, when I feel upset about this issue, I remember how sad, awful and pathetic my life was when I was dieting. It is that feeling that creates a sense of urgency and compassion for this movement. I feel very clear about where I stand in relationship to this cultural problem, which helps. For the women reading this article, what can they do today to feel better about their bodies? First, take time to recognize that you haven’t done anything wrong. You didn’t ask to be taught how to hate your body. You were non-consensually given that information. The problem is our culture; we teach women that our bodies are messed up and wrong. Try to move the problem from inside of you to outside of you. If you do this, it means you might get mad, and women have been taught that being angry is not feminine. Trust me: it doesn’t matter. Being taught this for our entire lives is an example of a wrongdoing. Focus on your thoughts first. Change will come once your ideology becomes to change. Another really important action is to audit the people and media in your lives. Give yourself permission to amplify your time with things and people that make you feel good, and pull back on the things that feel bad. Start with the low hanging fruit. If you have a subscription to a magazine that makes you feel bad about yourself, cancel it. If a TV show makes you feel awful, stop watching it. But how should women do this with the people in their lives? I recommend taking a mathematical approach. Figure out the key people in your life creating negative energy and look at your calendar. Set a deadline for three months from now and make the decision to cut back 50 percent on time spent with them during those three months. Once you hit the three-month mark, ask yourself if your life is better without that person. If the answer is yes, cut back another 50 percent over the next three months. Do that until you eventually phase them out. It’s a really concrete way to do it, and takes the power out of your hands if it feels too tough to cut someone out. With this method, you’re just watching the math. Want to learn more about Virgie and her activism? Visit www.virgietovar.com.